Plush Cheesy Puffs: Giant stuffed bag of cute plush cheese snacks. If you’ve got a hankering for cuteness, curl up with Plush Cheesy Puffs. The soft, pillowy sack is modeled humorously after snack food bags down to the fake nutritional facts on the back (it contains 100% of your Daily Value of cuddles, in case you were wondering). Open the zippered top to remove the furry, palm-sized puffs inside. These crinkly plush toys are fun to squeeze and throw, although they’re much more darling than delicious. You’ll love feeling the luxuriously soft texture of these snuggly snacks, and, best of all, you won’t have any cheese dust on your hands afterwards. Junk food only exists to make us happy, so it’s fitting that toy junk food is full of smiles. 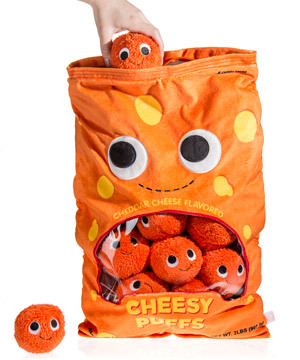 Like everything from planet Yummy World, Plush Cheesy Puffs are a familiar food made adorable. This happy bag is full of nine cute lil’ plush puffs that have a crinkly texture in place of a fried crunch. The soft balls can be taken out for a fuzzy food fight or left in the bag to make the soft sack more huggable. Hugs need to be added to the food pyramid. Sprawling out on the couch with a bag of cheesy puffs is nothing new, but now it’s even more comfortable than ever! 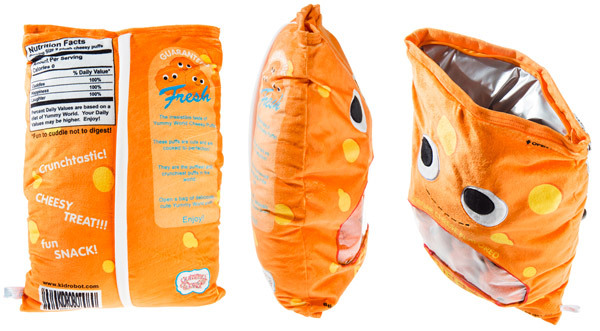 The Plush Cheesy Puffs sack has an ultra-soft exterior that feels great against your cheek. In addition to the soft puffs inside, the back of the bag is stuffed for extra comfiness. Conveniently, the bag is pillow-sized for when that lounge session turns into nap time. Part of what makes Plush Cheesy Puffs fun is the way they’ve mimicked food packaging while adding their own twist. 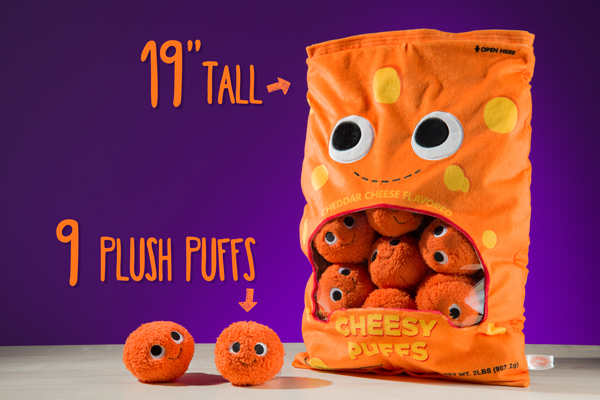 Like a real snack bag, the front of Plush Cheesy Puffs has a viewing window so you can peer at the goodies inside. Unlike a real snack bag, the top is zippered for easy closure and the nutritional facts references “laughter” rather than vitamins. Overall, it’s not enough to fool you into eating one, (we hope!) but it’s more than enough for a good laugh. Available in the snuggle aisle. Question: Would this make a good pillow? Answer: Plush Cheesy Puffs probably wouldn’t be ideal for your everyday pillow, but it would certainly work for a quick nap. Question: Can I throw the puffs at people? Answer: You’d better ask those people. However, we can confirm that they are soft enough to make a fun, pain-free projectile.